Ezri Dax: You’re sure you’re not angry? 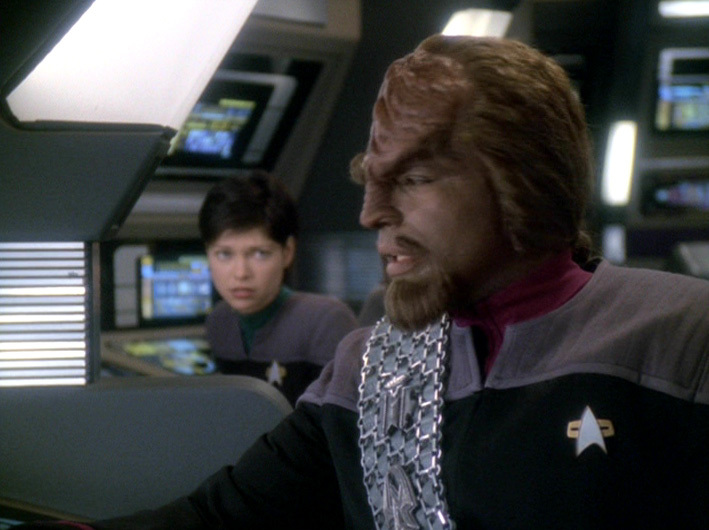 Worf: Why should I be angry? I have been asking you to tell the Doctor how you feel about him for the past month. Ezri Dax: Well – now that he knows how I feel…? Worf: I am happy for you. Ezri Dax: That’s a relief. Worf: But… I am going to kill him. Ezri Dax: You’re kidding, right? Worf: And in truth, I understand his position. It is the duty of every soldier to support their leaders in time of war. 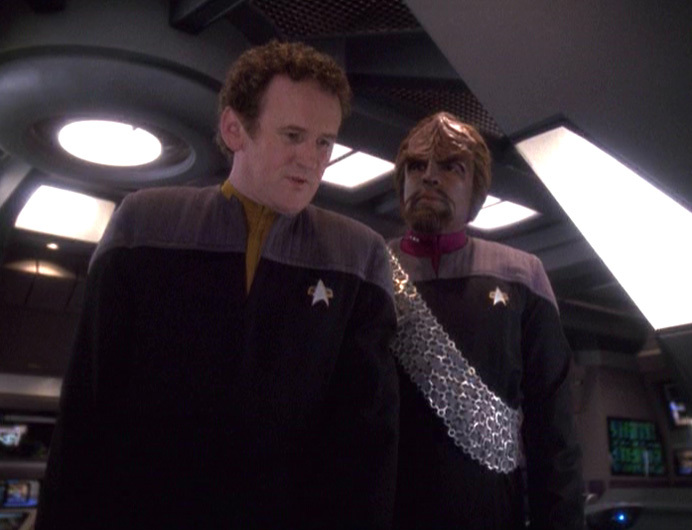 Asking Martok to stand against Gowron was a foolish error. Ezri Dax: So what are you going to do? Worf: Try to convince Gowron to discontinue these attacks. You have said very little. 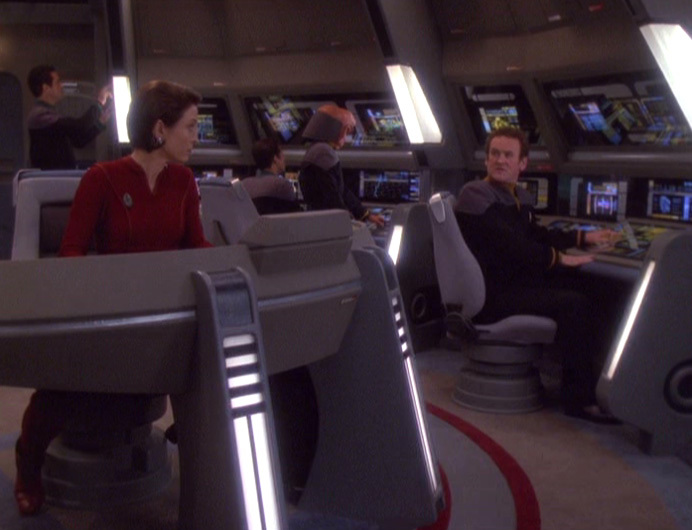 Ezri Dax: Look, I’m just not sure that I should be giving you advice on what to do in this situation. It’s a Klingon matter. Ezri Dax: This is the first that I’ve heard of it. 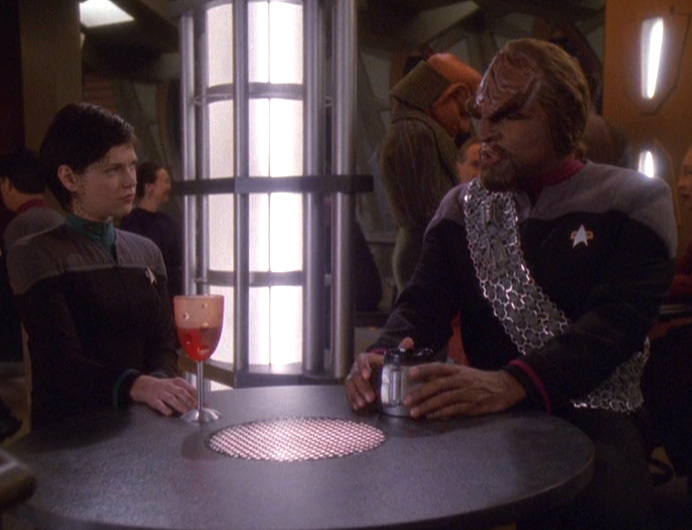 Worf: The General and I talked about it weeks ago. He likes you. And he considers you an honourable woman, a worthy successor to Jadzia, and so do I.
Ezri Dax: That’s very sweet of him. Ezri Dax: Not a very Klingon word, is it? Ezri Dax: It’s very honourable. Worf: Better, albeit a little obvious. Now, tell me what you think. Ezri Dax: Okay. But I’m not sure you’re going to like it. 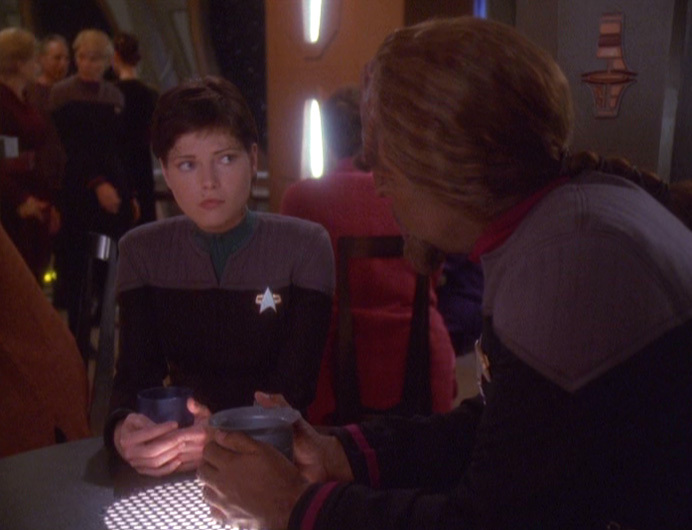 Ezri Dax: I think that the situation with Gowron is a symptom of a bigger problem. The Klingon Empire is dying. And I think it deserves to die. Worf: You are right. I do not like it. Ezri Dax: Don’t get me wrong, I’m very touched that you still consider me to be a member of the House of Martok, but I tend to look at the Empire with a little more scepticism than Curzon or Jadzia did. I see a society that is in deep denial about itself. We’re talking about a warrior culture that prides itself on maintaining centuries old traditions of honour and integrity, but in reality it’s willing to accept corruption at the highest levels. Ezri Dax: Am I? Who was the last leader of the High Council that you respected? Has there even been one? And how many times have you had to cover up the crimes of Klingon leaders because you were told it was for the good of the Empire? I know this sounds harsh, but the truth is, you have been willing to accept a government that you know is corrupt. Gowron’s just the latest example. Worf, you are the most honourable and decent man I’ve ever met, and if you’re willing to tolerate men like Gowron, then what hope is there for the Empire? Nog: This is bad, very bad. Kira Nerys: You say that every time we take the Defiant into battle. Nog: Impulse manifold purged and clear. – If we lose the Chin’toka system, we lose our only foothold in the Dominion territory. I think that qualifies as bad. Kira Nerys: Oh, we haven’t lost it yet. – Initiating impulse pre-start sequence. Nog: Microfusion generators online. – But the Breen, they seem unstoppable. First Earth, now Chin’toka? Worf: Ensign, no one is unstoppable. – Collimate the nadion emitters. Nog: Collimation sequence in progress. Julian Bashir: What more can I say, Miles, but ‘I’m sorry’? Miles O’Brien: Dilithium matrix is aligned and calibrated. – Just be a bit more careful, that’s all I ask. Kira Nerys: Opening antimatter injector ports. – Trouble in paradise? Julian Bashir: It was nothing. – Emergency life support and damage control systems standing by. Miles O’Brien: I wouldn’t call it nothing. Ezri Dax: Autonomous guidance system initialized and active. Miles O’Brien: He lost Travis. Kira Nerys: Hm – sounds serious. – Verify astrometric database. Julian Bashir: Miles built this Alamo model, replete with small figures. Quite spectacular, actually. – Data sets loaded and verified. – Anyway, he was showing it to me in Quark’s when we – rather I – accidentally misplaced Colonel Travis. Nog: Phaser safeties engaged. – Can’t you make another one? Miles O’Brien: What, so he can lose it again? – Field stabilizers online. Miles O’Brien: It’s not a toy! It’s a model, built to scale. Julian Bashir: He really did a fantastic job. Miles O’Brien: Nacelles holding at pre-warp threshold. Ezri Dax: You’re a good friend, Worf. Ezri Dax: You have the biggest ego of any man I’ve ever known! Worf: Considering how many men you have known, that is quite a statement. Ezri Dax: And… it was Julian. Ezri Dax: Isn’t that strange? I wonder what it meant. Worf: Dr. Bashir is a Breen. Benjamin Sisko: Hey, Jake that was a hell of a game! A hell of a game! 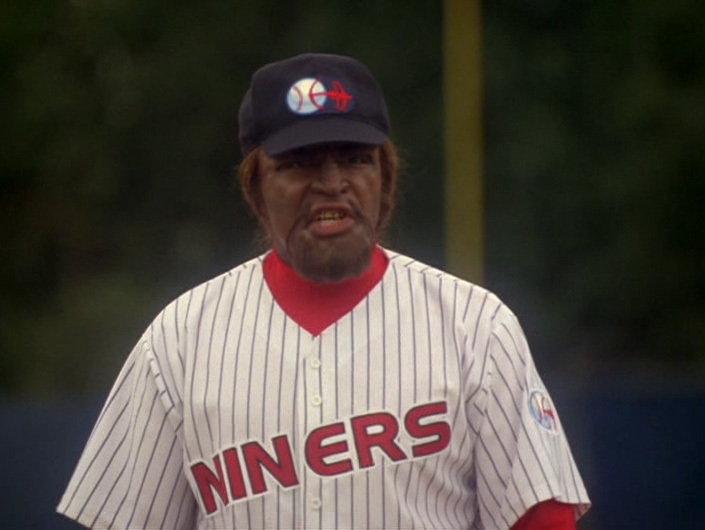 Jake Sisko: I gave up ten runs. Benjamin Sisko: They’re Vulcans. If they were humans you’d have held them to just two or three. Jake Sisko:When you put it that way. Benjamin Sisko: Yes. Now, pardon me. I owe you an apology. Rom: No. Unless you really want to. 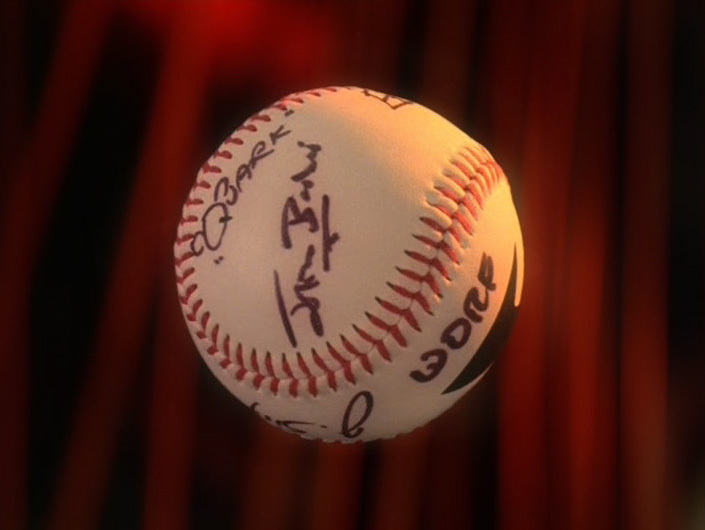 Benjamin Sisko: If you have some time one day, maybe you can teach me how to bunt. Rom: Sure… What’s a bunt? Solok: I fail to see why you are celebrating. The Ferengi’s bunt was an accident. And you still lost the game. Benjamin Sisko: You are absolutely right. And I couldn’t be happier. Quark, a round of drinks for the house on my tab. Quark: I’m way ahead of you, Captain. Solok: You are attempting to manufacture a triumph where none exists. Kasidy Yates: I’d say he succeeded. Julian Bashir: To manufactured triumphs. Benjamin Sisko: Manufactured triumph. Hear, hear! Solok: This is a typical human reaction, based on emotionalism and illogic. Benjamin Sisko: Did I hear irritation in that voice? 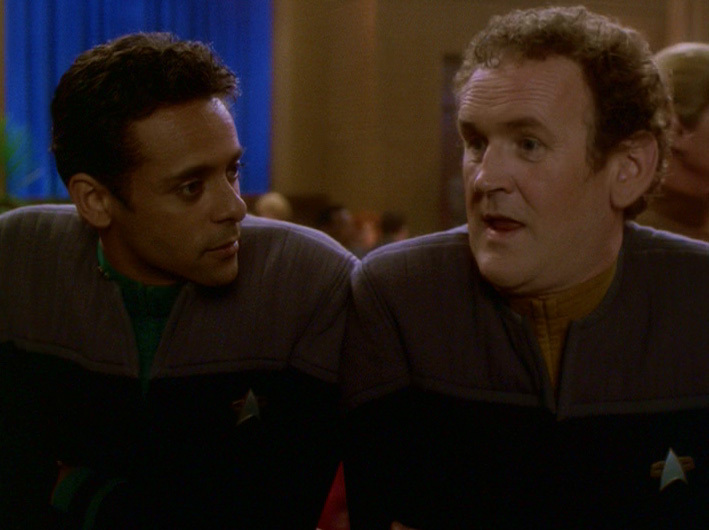 Julian Bashir: That sounded positively defensive to me. Miles O’Brien: With a hint of anger. Quark: And just a touch of jealousy. Kasidy Yates: And a lot of bitterness. Ezri Dax: Are you always this emotional? Solok:I refuse to engage in this human game of taunting. Ezri Dax: Human? Did I forget to wear my spots today? Quark: All that intelligence and he still doesn’t know what a human looks like. Kira Nerys: Captain. Here’s something else for your desk. Benjamin Sisko: Well, will you look at that. Would you like to sign it? Miles O’Brien: He didn’t touch home, Nog! Nog: Wha- what do I do?